J88PT Taiwan takes place from Dec. 12th to 16th, but you can already get a ticket for the Main Event by participating in Satellites on J88Poker. The easiest and fastest way is just to pay the ₵6,600 buy-in for the <J88PT 巡回赛 Taiwan Satellite>, which is held every weekend. ₵6,600 is not much compared to the original buy-in, but actually you have a chance to get it cheaper or even for free! 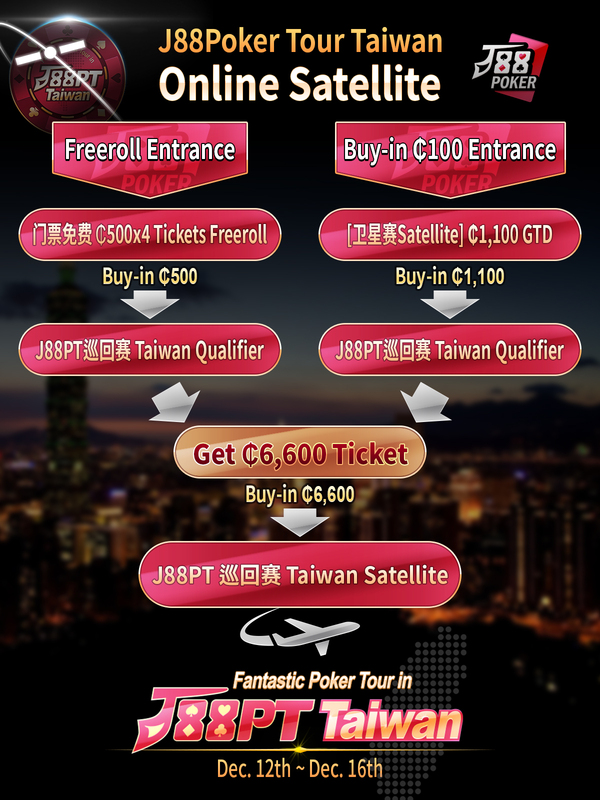 There are <J88PT巡回赛 Taiwan Qualifier> satellites with two different buy-ins: ₵500 and ₵1,100. The prize is a ticket for the <J88PT 巡回赛 Taiwan Satellite>. You can play in our freerolls <门票免费 ₵500×4 Tickets Freeroll> to get a ₵500 ticket or pay the ₵500 buy-in directly. You can pay the ₵100 buy-in to play in our satellites <[卫星赛Satellite] ₵1,100 GTD> to get a ₵1,100 ticket or pay the ₵1,100 buy-in directly. These tournaments are held every day, except the Burning Sundays on Oct. 28th and Nov. 25th. If you check our tournament schedule, you will see that you have many chances to get a ₵6,600 ticket for the <J88PT 巡回赛 Taiwan Satellite> during weekdays, so there is no need to rush!